Nose: Blackberry pie, clove, oak. Palate: Medium-bodied and mostly dry. Baking spice, blackberry, mulberry. Finish: Crushed blackberry, toasted oak. Parting words: Fennville is Michigan’s only sub-appellation. It’s as old or older (sources conflict) than its parent AVA Lake Michigan Shore. It’s essentially a one winery appellation. That winery is Fenn Valley. It’s to the north and west of the big wineries in LMS, so it doesn’t get the same traffic as the others, but it’s very much worth a trip up the road to Fennville or to the tasting room in Saugatuck. Those are the only place one can reliably find Fennville wines. Judging by this one, it’s a prime spot. This wine is a classic cool-climate Merlot. It has the chewy fruit one expects from Merlot, but with that cool climate (and cool vintage) tang that brings it all together and makes it a perfect match with pork chops, roast duck or sirloin steak. At $22, it’s worth every dollar and more. 2013 Fenn Valley Merlot Reserve is highly recommended. Place of Origin: Langley Vineyard, Bower’s Harbor estate, Old Mission Peninsula AVA, Traverse City, Michigan, USA. Nose: Blueberry, cherry juice, oak. Palate: Medium sweet. Cherry juice, blackberry, pepper, chewy leather on the back end. Finish: Cherry and lightly fruity. Stays in the cheeks for a good bit of time. Parting words: 2896 is Bowers Harbor’s big, flagship red. The 2013 vintage is currently selling on the BH website for $55 and the 2012 vintage (considered the best recent vintage for Michigan reds) for $100. I haven’t had either of those, so I don’t know if they’re worth the money, but they are both at the top end of red wine prices in this state. As for this wine, it’s very good and worth the price that was on the shelf on which it sat. It is well balanced, but still has the laid back, fruity character of a cool season Bordeaux-style red. Enough oak and alcohol to keep it from becoming a fruit bomb but not aggressive or overly tannic. It goes well with beef and smoked or grilled meats. My only complaint is that the gold wax is very hard to get off and it looks corny. The bottle would be better off without it. At any rate, at around $40 or so, 2896 Langley 2010 is recommended. Nose: Toasted oak, grapes, black currant, blackberry, whiff of hardwood smoke. Palate: Medium bodied, mild and slightly chewy. Wild blackberry, toasted oak, strawberry, green peppercorn. Finish: Oak, mixed berry pie. Parting words: Merlot is not a popular grape for varietal bottlings in Michigan. Its parent, Cabernet Franc, is more dependable in Michigan’s climate and is more widely planted as a result. Merlot makes up less than 4% of Michigan’s total wine grape acreage and most of that in the more continental climate of the south and southwest of the state. It’s important to note that this is a Michigan Merlot, not an Old Mission (or any other specific AVA) Merlot. That means that the grapes that were used to make this wine probably came from a variety of vineyards from across the state. This is a good strategy even for a winery located in northern Michigan like Black Star Farms. Merlot doesn’t take to northern Michigan as well as Pinot Noir and white wine varieties do, so why chain one’s self to a single appellation? Some of the distinctiveness of the wine may be lost, but that’s better than being distinct in a bad way. At any rate, this is a tasty example of what this grape can do in this state. It goes beautifully with pork, lamb and beef dishes (I drank it with all three) and works nicely after dinner too. The price (at lest for the latest vintage) is too high, but it’s not too far out of line with other quality Michigan red Bordeaux varietals. Try to find it in the $20-$25 range. The 2010 vintage is ready to drink now, but it could probably go another year or two and be just as good or even a little better. 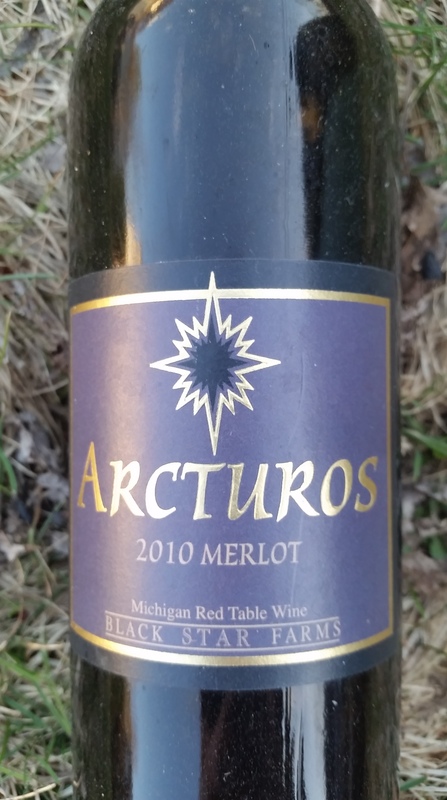 2010 Arcturos Merlot is recommended.